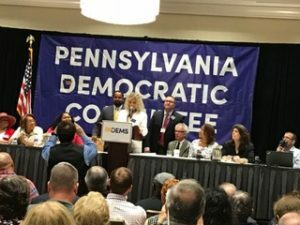 The Pennsylvania Democratic State Committee met on Friday and Saturday, June 15-16, 2018, at the Sheraton Hersey Hotel in Harrisburg. The first day consisted of “Deminars” (seminars) educating attendees on topics such as New Chair Training, Engaging GenZ, New State Committee Member Training, Finance Compliance and Reporting, and Best Practices for Party Building. There were also caucus meetings for Veterans, LGBT, Labor, Rural and a DNC Committee meeting. In the late afternoon there was a Women Candidates forum followed by dinner. All caucus and Deminar meetings are open to the general public as well as to credentialed State Committee members. Many feel that the first day (Friday) is the more stimulating of the two because then a lot of one-on-one conversations and politicking take place in the lobbies, restaurants, and elsewhere around the Hotel. The banquet that night, for many, is the highlight of the weekend. (Cost is $20.18 per ticket.) Democrats of national importance (Senators, Congressional Representatives, Governors, Cabinet Members and the like) appear and give significant speeches. This time it was Conor Lamb, the new Congressman from western PA who recently won a special election in a Republican District against a candidate backed by Trump. Lamb flipped the seat and gained much positive attention for our side. It’s no secret that he is a nice-looking young man who stands tall at the podium. Many have seen TV clips of him speaking on the stump. But the banquet was a different kind of forum. Lamb gave a speech of standard Democratic fare but he did so with humor and a fresh, appealing, and dynamic delivery. He was a big hit. The second day, the morning consisted of meetings for the Black, Progressive, Senior, County Chairs, Women’s, Latino and PA Young Democrats Caucuses. Late morning hosted the Regional Caucuses which represent the Commonwealth by geographical regions: Southeast (the largest with 73 members), Philly (next with 49), Allegheny, Northeast, Northwest, North Central, South Central, and the Southwest. Elections for caucus officers was conducted. The functions of the regional caucuses are to discuss issues of concern for their regions, pass nonbinding resolutions, provide a forum for statewide candidates, and make recommendations for endorsements. The Southeast region consists of Berks, Bucks, Chester and Delaware Counties. It will be critical for taking back the US House in this November’s General Election. The official business of the State Committee Meeting began at 12 noon. 315 Delegates were in attendance. The outgoing Chair, Jack Hanna, spoke about the current incumbent in the White House threatening our life in America. The ripping apart of families runs counter to the American way. We may lose the American Dream. The recently passed tax bill means attacks on working families. The eroding of healthcare services means more of the same. To achieve commonsense gun regulations we look to Young Democrats to lead the way. There are seven women US Congressional Candidates up for the General Election. They need our support. Our job is to provide a venue and a structure to make change in our country. We need to assist diversity in the Democratic Party. There are reforms needed on the role of Superdelegates at the National Convention such as not allowing them to vote on the first ballot. Hanna also spoke about the #METOO movement as an important milestone in how we as human beings treat each other. He received a standing ovation from the committee in appreciation of his service. Just as, locally, the Chester County Democratic Committee recently elected their officers following the Primary of the year the Governor is elected, so too the State Committee is required to do the same. Candidates for State Committee Chair, Vice-Chair, and Treasurer were nominated and spoke. Only recently elected PA Democratic State Committee Members could participate, i.e., speak, nominate, second and vote. The meeting, however, was open to the general public. Nancy Mills was overwhelmingly elected to be State Party Chair with 216 votes. She is the first woman elected to this position in the history of the Democratic Party in Pennsylvania. She had spoken about how our defeats in the past will drive us now. This is where we learn. As State Chair she will balance the interests of urban and rural areas. We must move together; otherwise, “…this man can be reelected who puts babies into concentration camps.” We must win elections to prepare for 2020. Following the general business meeting, votes were conducted to elect Executive Committee members by State Senatorial Districts. The committee will meet as needed to select statewide candidates for special elections. The meeting adjourned around 3 PM. If there are issues of concern, please let your State Committee members know so they can be brought to the attention of the statewide organization.